Nitric oxide is known to act as a biological messenger in divers signal transduction pathways in animal organisms. Initial investigations suggest that plants use nitric oxide as a signaling molecule via pathways remarkably similar to those found in mammals. Especially, the siganiling role of NO during plant defense reactions is well established. However, mounting evidences support the hypothesis that NO is a more general effector of plant growth and development. In our laboratory, alfalfa cell cultures were used to investigate the possible involvement of NO in the regulation of cell division and differentiation in plant cells. The homogenous population of leaf protoplasts were cultured in the presence of a NO donor, sodium nitroprusside (SNP) and/or an inhibitor, NG-monomethyl-L-arginine (L-NMMA). BrdU incorporation frequency into the nuclei of the protoplast-derived cells indicated that the entry into the S-phase of the cell cycle is enhanced by SNP and inhibited by L-NMMA treatments, respectively (see Figure 1). Experiments have also been carried out with continuously dividing cell suspension cultures. The obtained data indicated that these type of cells are insensitive to similar treatments shown to affect protoplast-derived cell division (see Figure 2). BrdU incorporation frequency into the nuclei of leaf protplast-derived alfalfa cells during the third day of culture. The cells were treated by the indicated drugs affecting endogenous NO formation. For cell culture details see . 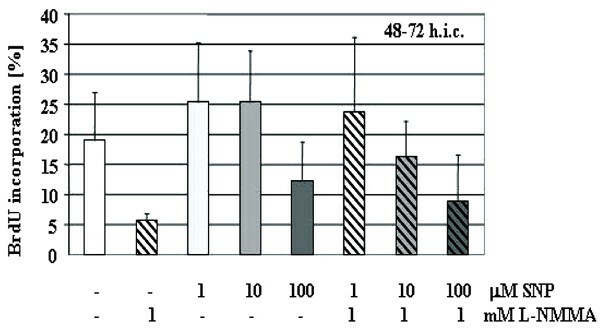 BrdU incorporation frequency into the nuclei of cell suspension-cultured alfalfa cells during the third day after subculture. The cells were treated by the indicated drugs affecting endogenous NO formation. For cell culture details see . In addition to cell cycle progression, the effect of the above drugs on the auxin-induced formation of embryogenic competent cells from leaf protoplasts (for more details see [1, 2]) have been followed. 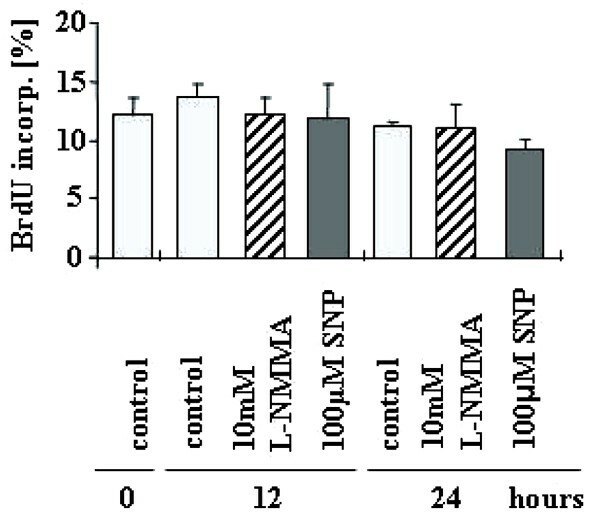 The promotive effect of SNP and the inhibitory effect of L-NMMA have been observed on the process, especially at low exogenous auxin (0.02 μM 2,4-dichlorophenoxyacetic acid) supplementation. The obtained experimental data indicated that NO is required for and can stimulate auxin-mediated activation of cell division as well as embryogenic cell formation from differentiated leaf cells (protoplasts), but is not involved in the regulation of cell cycle progression of continuously dividing cells. The presented work was partially supported by the national grant OTKA T34818.